Clarabelle is adjusting quite well and doing fine. I was thinking that I should write something, but it seemed too soon. But, in a nutshell: Clarabelle is also having her ups and downs, but she really is doing fine. out various things and laughing loudly) will suffice. We let our kids use their scooters in the house (tho they don’t do it too much anymore). I’m compelled to report that the dog “landmines” (there were three scattered about)did not appear to be Clarabelle’s (never mind how I know this) but appeared to belong to Sarah, our 16-year-old Lab/shepard who regularly loses control of her hinder quarters. The first week we had Clarabelle, Gio had three friends over on a Saturday afternoon – so we had four boys (ages 6-9) tearing through our house nonstop for about 3 hours shooting Nerf guns. Everyone survived. It took a couple of weeks, but Clarabelle has made peace (mostly) with our two cats, and they with her. And we seem to be managing OK with Clarabelle and our three rabbits. Clarabelle used to bark at my husband (Kevin) every night (never mind that he’s the one who feeds her every morning), but I think she’s getting a little better about that. Early this morning (about 6:15), I coaxed Clarabelle to snuggle with Kevin in bed. Her tail was wagging, she was snuggling, her head was right next to his – and then she very unexpectedly threw up the entire contents of her stomach. I’m sorry to say that, at that moment, this seemed like the most hilarious thing I’d ever seen. Clarabelle wagged her tail through the entire event – even us stripping the sheets. Clarabelle gets walked every day (by Kevin), and it’s wonderful. She’s a sweetie. Anyway, that’s the news this morning. Clarabelle is doing well. We all are. 1 month rub Clarabelle’s tummy for me!! 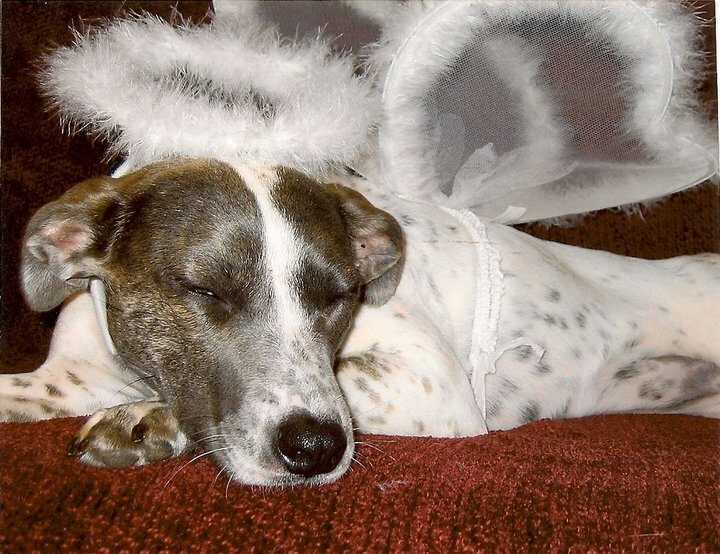 I absolutely love this photo of Clarabelle and her angel wings and I absolutely love that you and your family took this dear sweet dog and made her a part of your family. Just a reminder that life does in fact go on. God Bless you for sharing with us twitter followers. Thanks for the update. It certainly made me laugh. This is just too funny about Clarabelle. You must have a very kind and patient husband. I don’t think mine could have handled that. Sorry to miss your phone call. Please call again whenever you have time. I think your household is actually busier than mine.